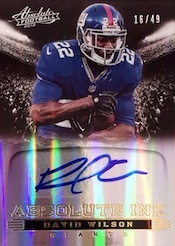 2013 Panini Absolute Football pushes the hits. With one per pack, each box breaks down to two autographs and two memorabilia cards. Of course, it's not all hits. Boxes also have four Hogg Heaven inserts, a pair of parallels and two rookie cards. 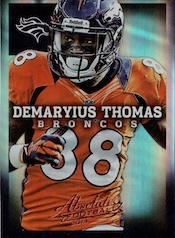 The 2013 Panini Absolute Football base set has an overhauled design. Rather than focusing on a particular play, photos focus entirely on the featured player. Spectrum parallels return in a variety of colors and rarities. Rookie Premiere Materials return. 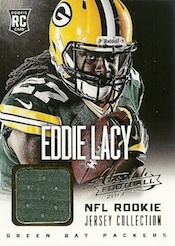 The autographed cards use multiple swatch windows to display the jersey pieces. All are numbered to 299 or less. Parallels go as low as one copy. These can include patches, Nike swooshes, laundry tags and NFL shields. 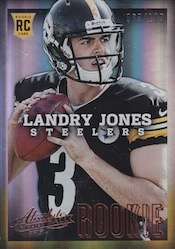 Unlike last year's Rookie Premiere Materials cards that came with on-card autographs, it looks as though they've been switched to stickers. Tools of the Trade, long a staple for the Absolute brand, come with a broad mix of memorabilia pieces. Besides jerseys, collectors can look for pieces with gloves, shoes, face masks and helmets. All Tools of the Trade cards, signed and unsigned, are numbered to 99 or less. 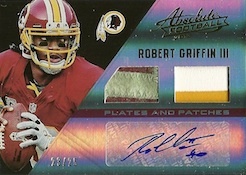 Plates & Patches, which also has signed and unsigned versions, come with both a prime jersey swatch and a piece of the player's name from the back of their jersey. This set focuses on veterans and retired players with all being numbered to 49 or less. Rookies are featured in Leather & Lace. Numbered to 49 or less, these come with pieces of leather or the lacing from player-worn shoes alongside a piece of a player-used football. Hogg Heaven inserts land one per pack. Parallels include Boss Hogg (#/99) and Hogg Wild (#/10). Good: Hogg Heaven is one of the coolest basic inserts of the year, lots of autographs and memorabilia. Bad: Several designs are way too busy, parallels are plentiful but not distinct. 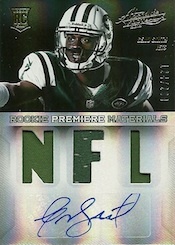 The Bottom Line: On its own, 2013 Panini Absolute Football does a solid job of delivering autographs and memorabilia. However, it joins a crowded slate of releases that follow far to similar a pattern: foil base cards, lots of parallels and an emphasis on using those parallels to create low serial numbers. Elite, Certified and Totally Certified all occupy similar territory. Oddly, the one-per-pack Hogg Heaven cards arrive with a very distinct look and feel. They’re the coolest cards in the set, even without any autographs or memorabilia. I just wish there was more to this product like that so that it would stand out more. At first, I went back and forth on design. Some aspects I like. Others I think are horrendous. 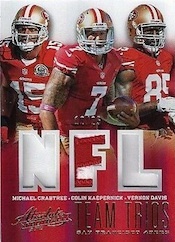 The base design is distinct, a big plus considering its another one that relies on foil stock. A couple of things stand out. Photos are close up and bring a lot of intensity. The fact that the photos bleed off the top but are framed in on the other three sides is odd. A small tweak in this regard would shore things up in the future if it’s revisited. 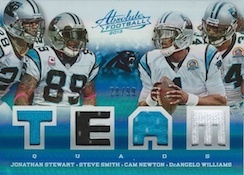 Putting the nameplate in the middle of the card is what really sets 2013 Panini Absolute Football apart from other sets. One would think this would cut the image off, but it doesn’t. Panini’s design crew did a very careful job of cropping and positioning so that the names and team go across the player’s chest. Where things fall apart for me are the rookies and parallels. The veteran cards walk a fine line of being too busy. Both the rookie cards and Spectrum parallels add another block of text. Done in foil, this large 3-D text makes the card way too cluttered. The subtle changes in color make for very mundane parallels as well — and there are lots of them. The one-per-pack Hogg Heaven cards are some of my favorite inserts of the year so far. The faux-leather texture gives them a nice feel as well. 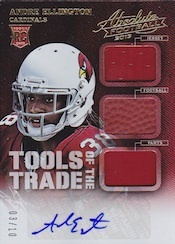 Other than the parallels, my least favourite cards in the product are the Rookie Premiere Materials. When the featured player has double digits for their jersey number or it’s the NFL variation, they’re not so bad. But the single-digit players leave a massive amount of empty real estate. 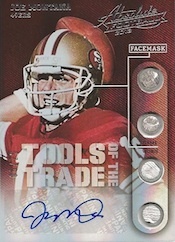 It feels like a lot of the cookie cutter designs that were used by several companies a decade ago to easily switch basic cards into autographs and memorabilia. And while I didn’t pull any Tools of the Trade cards, I really like how the various memorabilia pieces are labelled. They also have some great gear combinations. 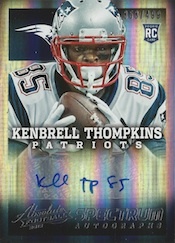 This is another set that relies heavily on rookies and parallels, at least when it comes to autographs. Veterans are a better represented when it comes to memorabilia cards. My biggest issue with the checklist isn’t so much the players as it is the daunting number of parallels. When they stand out, I like parallels. However most here use a slightly different color foil and there are tons of them. This feels like a go-to option for a lot of products (not just Panini). Frankly, I’m tired of it. Yes, it gives us more low-numbered cards, but is that what makes a great card? It helps, but not nearly as much as it once did. I’d rather see more distinct stuff like the Hogg Heaven cards. 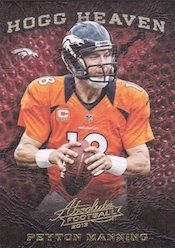 For a set that focuses on basic memorabilia cards, 2013 Panini Absolute Football offers more than a lot of other sets released this year. The standout design (for the attractive cards) goes a long way in helping this. There’s also a lot of built-in familiarity with the brand. There’s a bit of a step back this year with the increase in sticker autographs, but they’re integrated into the design better than a lot of other sets. I’ve gone back and revisited these more than a lot of other sets. Some of that’s to admire the things that I like, so is a bit of the opposite. I like that 2013 Absolute finds a way to stand out despite have a very similar configuration to several other recent sets. The saving grace for me are the Hogg Heaven cards. Had these been excluded for more parallels I think my feelings on this set would be a lot different. 2013 Absolute #160 Justin Brown RC AU 68 499 Steelers Auto Rookie Card! I’ve participated in group breaks of 5 cases now. There are some incredible hits. 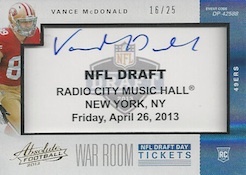 1 was a NFL Draft auto Ticket #/15. Never seen those before. 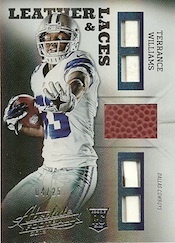 Some great patches, I got a Prime Patch of T. Williams #/25. Too many to mention rely. Base cards look much better than last year. The most beautiful football product in the last twenty years! Absolute football has the guts to catch the players in a close-up manner, as opposed to those far away shots that we have become accustomed of. You feel as if you are there with that player in the game! I have a hard time differentiating between the base and retail versions, is there a tell?